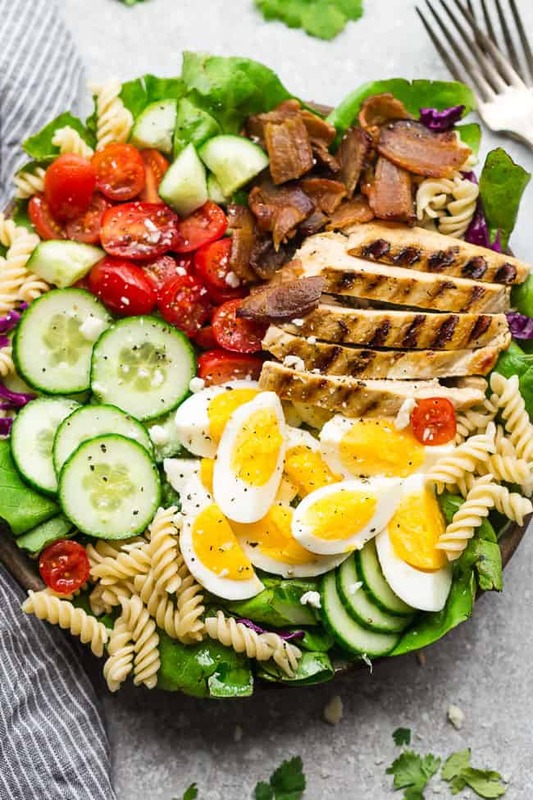 Chicken Cobb Pasta Salad – an easy side dish perfect for summer parties, picnics, potlucks and BBQ’s. Made with bacon, cucumbers, grilled chicken, tomatoes, hard-boiled eggs, cheese, and a homemade ranch dressing. 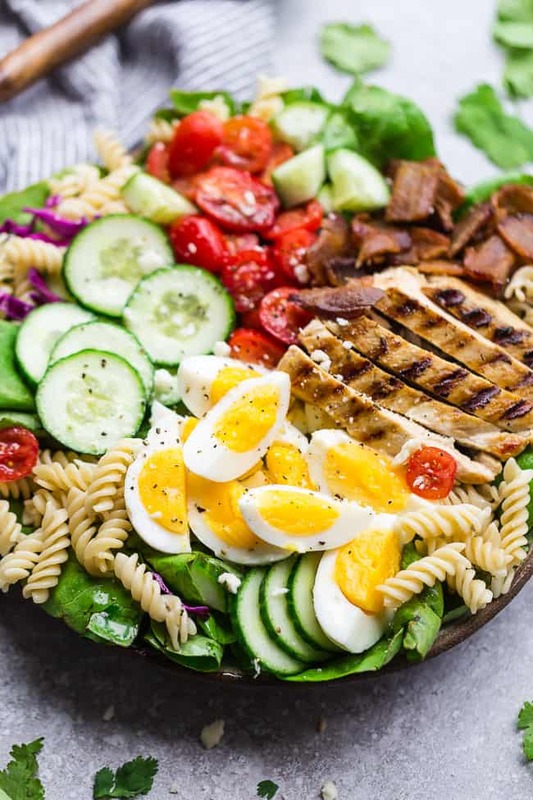 Summer entertaining is here in full swing and pasta salads are the perfect easy side dish for all those outdoor cookouts and barbecues. 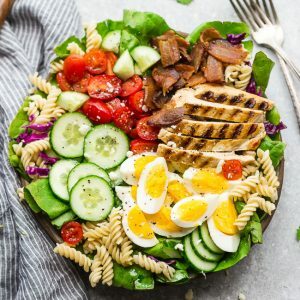 Cobb Salads are one of my favorite salads and this Grilled Chicken Cobb Pasta Salad combines all of those classic components. It’s full of flavor and loaded with avocado, bacon, cheese, chicken, eggs, tomatoes and rotini pasta. It comes together quickly in under 30 minutes and is perfect for summer entertaining. The great thing about salads is that they are so easy to customize. To save on time, you can also use leftover or rotisserie chicken or leave it out entirely if you like. Prepare and assemble the remaining salad ingredients starting with the lettuce plus any other greens you like. Add cooked and drained pasta, hard boiled eggs, grape tomatoes, cucumber, crumbled bacon and feta. Add any other toppings you like then drizzle with some creamy ranch dressing right before serving. 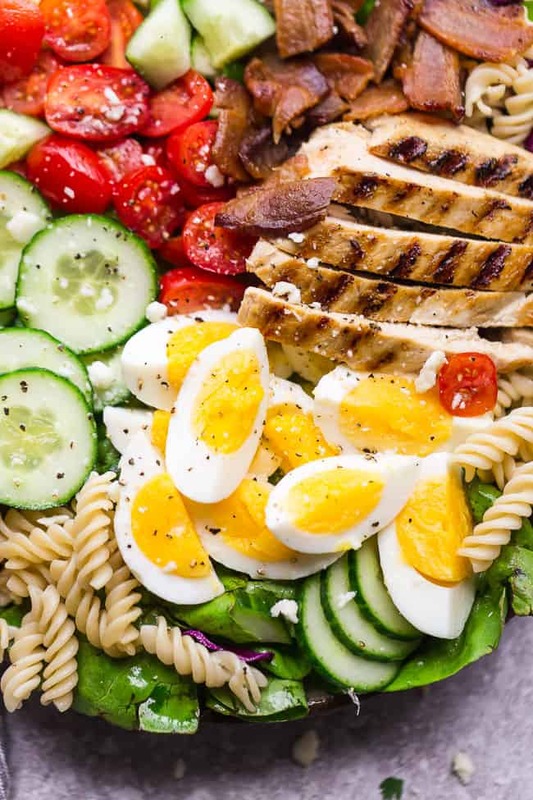 Can creamy pasta salads be made ahead of time? What ingredients to put in a pasta salad? Vegetables – tomatoes, peppers, cucumber, olives etc. Fruit – strawberries, blueberries, apples, watermelon etc. Protein – cheese, shredded chicken, tuna, turkey, diced ham, etc. 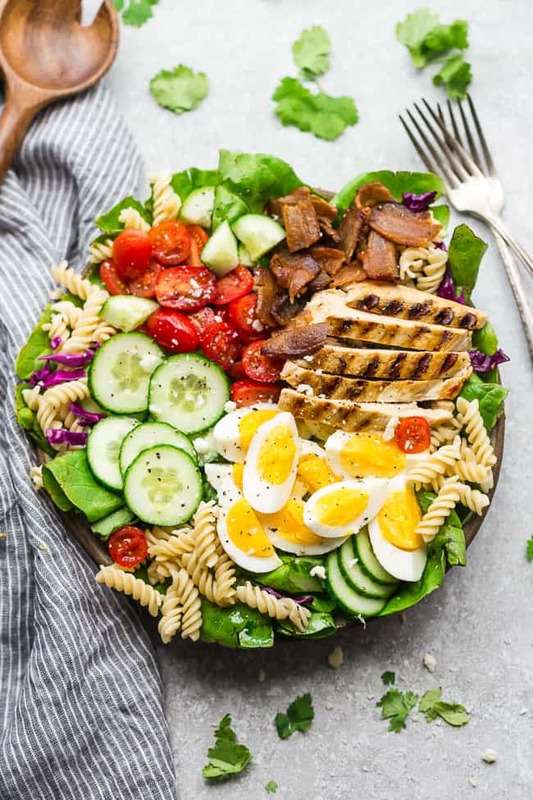 Have fun and mix and match to create a pasta salad you love! Use fresh and quality ingredients if possible. Adding some garden herbs helps to liven the flavors up even more. Cook your pasta to al dente, according to the package directions. Each shape of pasta has a different cooking time, so check the package for the exact time. Once finished cooking, drain and toss with a bit of olive oil to prevent the pasta from sticking together. Cobb Pasta Salad - an easy side dish for summer parties, picnics, potlucks and BBQ's. Made with with bacon, cucumbers, grilled chicken, tomatoes, hard-boiled eggs, cheese, and ranch dressing. In a resealable zip-top bag, add chicken, salt, pepper and garlic and marinate for at least 30 minutes. Whisk together all the ingredients for the dressing (add liquid as needed to thin out sauce to desired consistency). Drizzle 2 tablespoons over the cooked pasta.